Simple space tattoos are an excellent tattoo category for both men and women. These artworks are usually small in size and minimal in style. So, you can get a space tattoo almost anywhere on your body. A small moon or any other planet tattoo on your arm will be a great reminder of just how incomprehensibly vast our universe is. Space has battled the mind of the humans since the beginning of time. We look up to the sky, and we are all inspired by the vastness of our universe. Some people can spend hours just by looking at the pictures of the planets, stars, and nebulas so much that they decide to get a tattoo. These simple space tattoos are beautiful, so we’ve gathered a fantastic collection. We’re sure that you will find a perfect idea for your next tattoo! 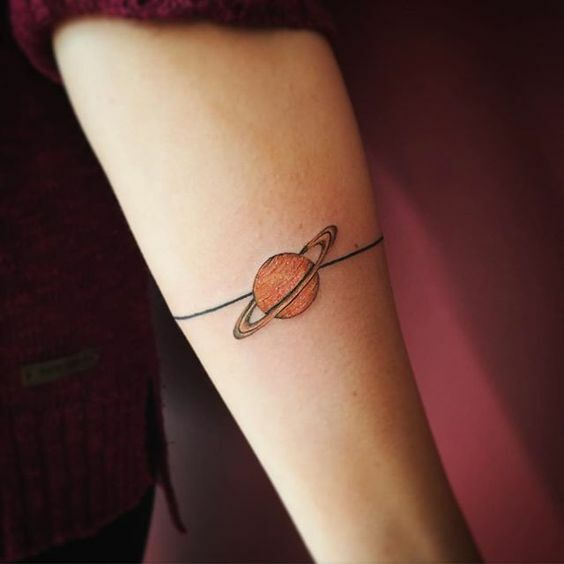 Simple black circle tattoo with the solar system planets inside. Sun, Saturn and moon tattoo on the fingers. Since the dawn of time, people looked up to the sky and wondered how far away are those stars and more importantly – what are they? Very soon, those observers noticed, that the sun, moon, stars, and planets followed specific paths in the sky. They also saw that those paths changed accordingly to the seasons. The ancient Egyptians noticed that the star Sirius matched with the floods of the river Nile. Colorful solar system tattoo on the inner forearm. Black hole tattoo on the arm by Violeta Arus. For thousands of years, stars in the sky lead the way for sailors and other travelers. Greeks saw their gods and other mythical creatures and formed the famous constellations that we know today. So, as we can see, stars and skies have been following humans for a very very long time. Today, we know much more about it. We have such powerful telescopes that we can see back in time. However, we know that even now we’ve discovered just a tiny spec of all of our universe. The deeper we go, the more we see. Only a single thought of how big is the cosmos blows up the mind. Just listen to this – there are more stars in the universe than there are grains of sand in all the beaches in the world. Milkyway galaxy tattoo on the inner arm. Comet tattoo on the belly by tattoo artist Nando. Who knows what more we’re going to discover and what lies beyond the observable universe? These questions are already a good argument for getting simple space tattoos. Colorful space tattoo on the arm. Saturn and small rocket tattoo on the fingers. There are lots of different celestial bodies, so lots of simple space tattoo ideas. However, like any other tattoo category, simple space tattoos also has trends. We’re going to go over the most popular ones. Big Dipper constellation tattoo on the forearm. Minimal space tattoo on the ankle. 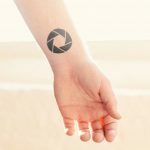 These are beautiful and minimal tattoos that are more suitable for women. They consist of thin lines and dots which depicts the stars and imaginable lines. There are 88 official constellations so that you can choose from a wide variety of different ones. Take a look at these cool constellation tattoo ideas. Two constellation tattoos on both arms. Subtle constellation tattoo on the arm. Sagittarius constellation and crescent moon tattoo on the inner arm. Minimal constellation tattoo on the forearm. Matching mother and daughter constellation tattoos on arms. Constellation tattoo on the arm by Joice Wang. Cancer constellation tattoo on the arm. Aquarius constellation tattoo on the inner forearm. Taurus constellation tattoo on the hand. Sisters tattoo idea – constellation on wrists. Constellation tattoo idea for sisters. Constellation tattoo on the left side. Minimal Orion constellation tattoo on the inner arm. Colorful Cancer constellation on the ankle by tattooist Banul. Leo constellation tattoo on the left rib cage. Libra constellation tattoo on the forearm. Sagittarius constellation tattoo on the ribcage. Various constellation tattoos on the left inner forearm. When talking about planets, usually we have in mind the ones in our solar system. Officially, there are eight planets in the solar system. People love to tattoo the Saturn because you can quickly identify it from its rings. Moon is also a trend in a tattooing world and usually goes together with a sun as a matching tattoo. Stars are another excellent option for a simple space tattoo. Of course, with our sun being the most famous and beloved star in the universe there are lots of others that you can have in mind while tattooing. All solar system planets tattoo on the inner arm. Black hand-poked Saturn tattoo on the arm. Black tattoo of a Saturn and its moons. Distant stars tattoo on the arm. Moon and constellation tattoo on the wrist. Moon tattoo on the back of the arm by Miso. Saturn tattoo on the arm. Shaded Saturn and Titan tattoo on the leg. Small moon tattoo on the ankle. Star tattoo on the inner forearm. Tiny rocket and Saturn tattoo on the ankle. Two-star tattoo for the children. Apart from celestial bodies, there are human-made objects that can make a perfect simple space tattoo. For example rockets or astronauts. Moreover, you can get some inspiration from sci-fi movies or books. An alien or UFO ship tattoo is another cool choice for a space tattoo idea. Tiny alien spaceship tattoo on the ankle. Micro rocket tattoo on the ankle. Another cute spaceship tattoo on the wrist.